Schedule outings for the time of day when the person with Alzheimer’s is at his or her best. Keep outings from becoming too long. Take note of how tired the person gets after a certain amount of time. Bring the person home before he or she becomes overtired. Does the person with Alzheimer’s disease know the restaurant well? Is it quiet or noisy most of the time? Are tables easy to get to? Do you need to wait before being seated? 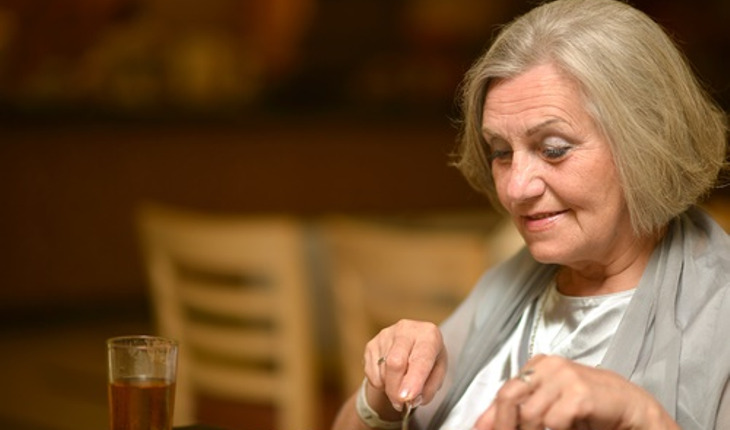 Are foods the person with Alzheimer’s likes on the menu? Before going to the restaurant, decide if it is a good day to go. If it is, think about the best time to go. Earlier in the day may be best, so the person with Alzheimer’s is not too tired. Also, the restaurant may be less crowded, and service may be quicker. If you decide to go later, try to get the person to take a nap first. Before you leave home, gather what you need. Helpful items may include utensils, a towel, wipes, or bathroom items. At the restaurant, tell the waiter or waitress about any special needs, such as extra spoons, bowls, or napkins. Ask for a table near the restroom and in a quiet area. Seat the person with his or her back to busy areas. Help the person choose a meal, if needed. Suggest food you know the person likes. Read parts of the menu or show the person pictures of the food. Limit the number of choices. Ask the server to fill glasses half full or leave the drinks for you to serve. Order finger food or snacks to hold the attention of the person with Alzheimer’s. Reprinted with permission from the National Institute on Aging. For more information on Alzheimer’s and caregiving, click here.